Taking place in Detroit, the Allied Media Conference (AMC) is an annual gathering of probably the most inspiring humans you will get a chance to meet. The conference brings together people who are using media-based strategies in social movement organizing (technology, design, film, art, music, anything you can think of really!) for four days of strategic sessions, hand-ons workshops and panels around justice, healing, and community building. As a newcomer to the AMC this past summer, my days at the conference were spent in awe. From the moment I arrived in Detroit and got my conference badge, I knew I was in to experience something very powerful—to partake in a space where stories were constantly being written, and lifelong friendships and alliances were formed. As the AMC goes into A Chrysalis Year—a much-needed period of rest and reflection after celebrating twenty years of fierce and fruitful media-based organizing—here’s an overview of the session “Ripple Mapping the Impact of the AMC,” an interactive installation tracing the outcomes of the conference since its creation in 1999. The map at the end of the exhibition, a web of stories. For this year’s AMC, And Also Too was asked to design a conference version of the Ripple Mapping Tool, a platform for mapping out the outcomes of specific events or programs. In its most basic form, the Ripple Map connects people with specific initiatives, circumstances, and project outcomes, using concentric circles to visualize stories as ripples in time. A close-up of the AMC Ripple Mapping Tool. 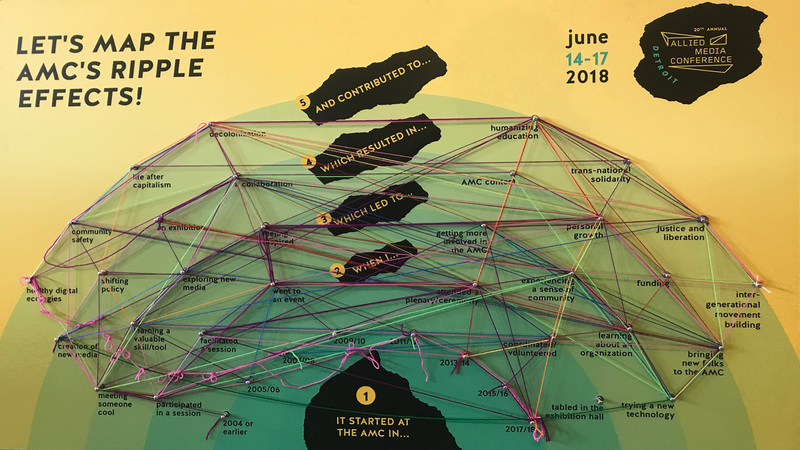 On this occasion, our studio re-designed this map in collaboration with AMC organizers, to reflect the unique activities and encounters taking place at the conference. 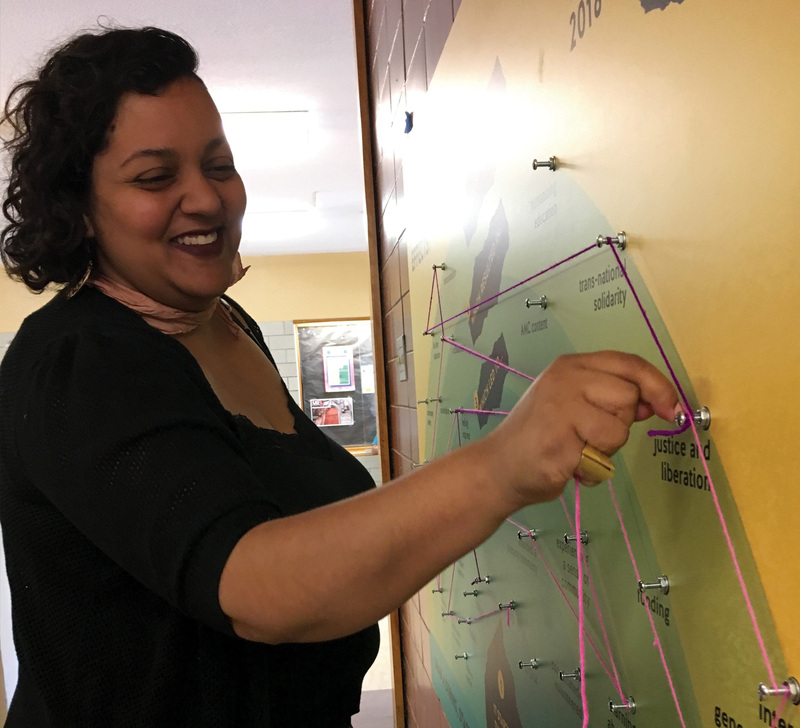 This led to a map specifically meant for visualizing outcomes about decolonization, life after capitalism, community safety, transnational solidarity, justice and liberation, and intergenerational moment building. And Also Too team members installing the AMC Ripple Map. 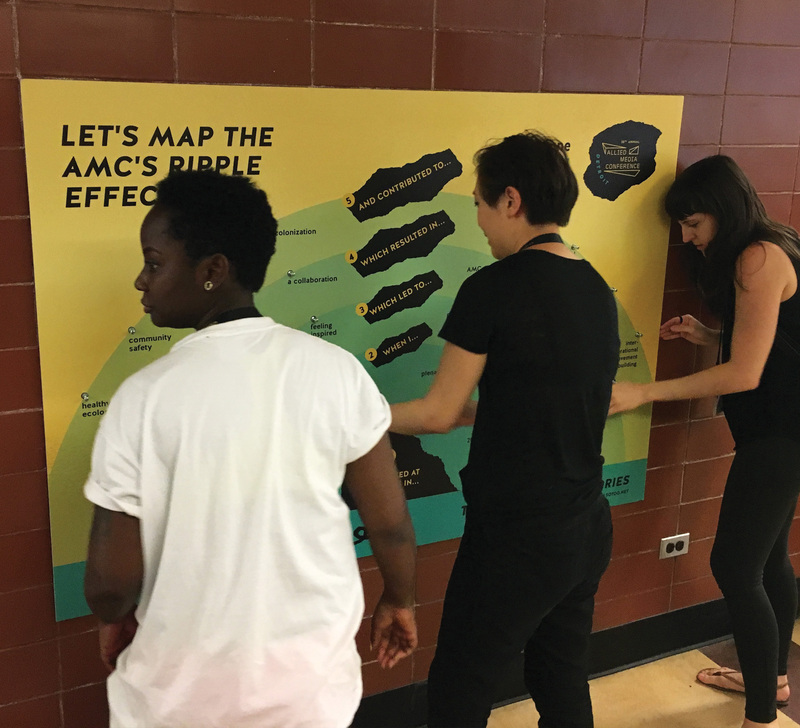 Spanning 4 by 5.5 feet, the AMC Ripple Map appeared as a prominent invitation for passersby to interact with it. 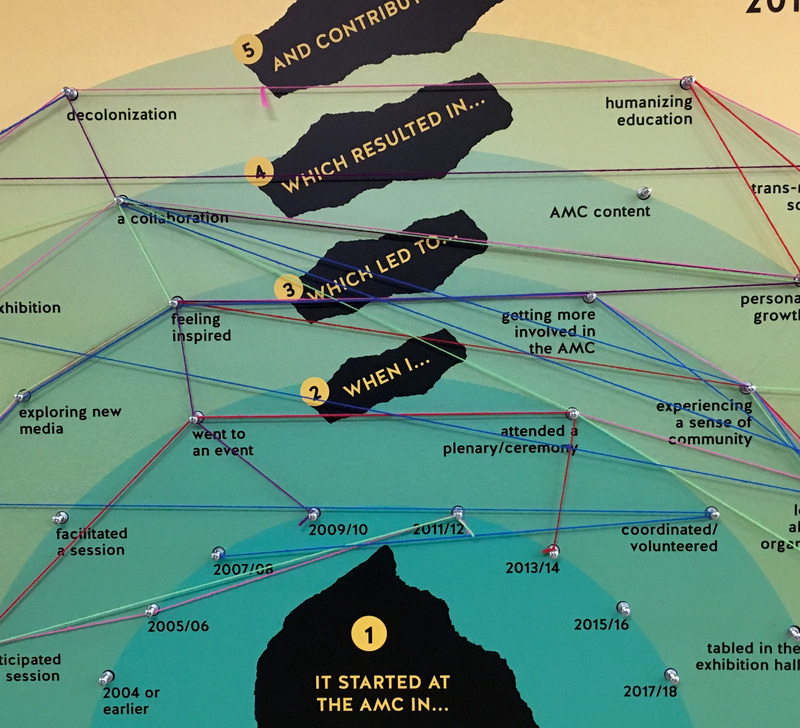 Attendees were prompted to tell their own AMC stories by connecting themselves to key points in the map— points representing dates, activities and outcomes. They did this by threading colorful strings onto screws installed at each point, thus creating intersecting paths of AMC memories. AMC participant mapping a story into the Ripple Mapping Tool. Seeing people interact with the Ripple Map brought me an incredible sense of hope, and reminded me that change is possible. As AMCers would trace their stories into the tool, a large network of incredibly talented people doing the work soon started to become visible. 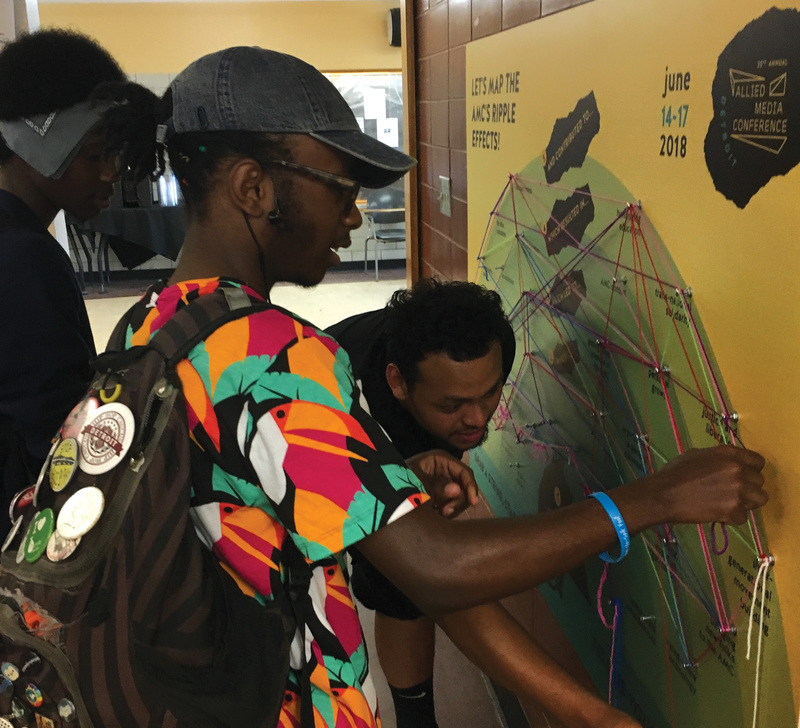 Hence, what the map ultimately did for me was visibilize and encourage critical connections, showing how those connections have produced—and continue to produce—real change in the world. What an honour to have been there.